"I think she's having hysterics mabey you should slap her." "I've never seen someone so prone to life threating idioticy." "This hostage stuff is fun." Mary Alice Brandon was born in Bilox, Mississippi in the 1900, and was changed sometime in the 1920 by a worker in the mental asylum where she was held because of her ability to have visions. James took the challenge of hunting her simply because another vampire desired her. Once it was clear to him that James was after her, he, the vampite who worked in the asylum, freed Alice and changed her before James could kill her. James killed the other vampire instead. She had no memory of these events, and was left to find her own way. At some point Alice saw Jasper in one of her visions. They found each other in 1948 and by 1950 they had found Carlisle. They have been members of the family ever since. Ashley Michele Greene was born in Jacksonville, Flordia on Feburary 21, 1987. 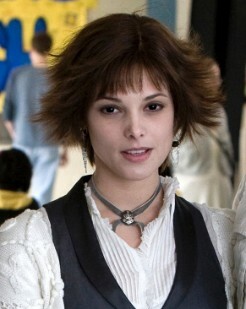 She plays Alice Cullen in the film Twilight. She initially planned to become a model, but was told that she was not tall enough to become a runway model. Ashley took acting classes so she could be in commercials, and fell in love with acting, and realized she preferred it over modeling. Greene's big break came in 2008 when she was cast as Alice Cullen in Twilight.